Buy I'm Stalking Jake! (exclamation point included)! Autographed copies are available worldwide; please e-mail prophecygirl922@gmail.com for more information. 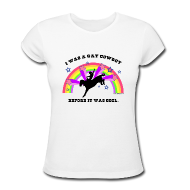 Buy an "I Was a Gay Cowboy Before It Was Cool" shirt (or other Gyllenhaal-themed clothing)! All content copyright © Becky Heineke 2010 - 2018 unless otherwise stated. Do not reproduce without permission.